What comes to mind when I say Casablanca? If your thoughts went to the 1942 Hollywood romantic movie ‘Casablanca‘ which starred Humphrey Bogart and Ingrid Bergman, you are not the only one; even Google makes the same mistake. 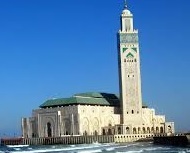 However, I will be talking about the city that inspired the movie, the Moroccan city of Casablanca. Have you ever wondered where the name Casablanca came from? Why would a Moroccan city not have an Arabic name, but a Spanish name? Why is there the color white in its name? Were all the houses painted in white when its name was chosen? 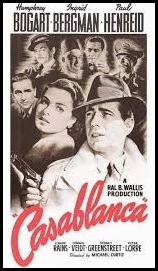 After all, a literal translation of Casablanca is ‘Casa‘ and ‘Blanca‘ or ‘white house’ in Spanish. Was Casablanca a Spanish conquest? In reality, the modern name of the city comes from the Portuguese ‘Casabranca‘ or ‘white house’ which turned into Casablanca when the Portuguese kingdom was integrated into the Spanish kingdom. The real name of the city was Anfa, founded as part of the Berber Kingdom of Barghawata in 744 AD. It is believed to have been one of the most prosperous cities on the Atlantic coast because of its fertile land. After the Portuguese wiped out the entire city in 1468, they used the ruins of Anfa to build a military fortress in 1515, and later renamed the city Casabranca. I wonder how many African cities were wiped out that way by Europeans; this is so reminiscent of the majestic Benin City which was burnt to the grounds by British soldiers in 1897. Between 1580 and 1640, the Crown of Portugal was integrated into the Crown of Spain, and the area was renamed Casablanca, even though it was still under an autonomous Portuguese administration. As Portugal broke ties with Spain in 1640, Casablanca came under full Portuguese control again. The Europeans abandoned the area completely in 1755 following an earthquake which destroyed most of the town, probably leaving the locals to fend for themselves. The town was finally reconstructed by Sultan Mohammed ben Abdallah (1756–1790), the grandson of Moulay Ismail, with the help of Spaniards from the nearby emporium. The town was called الدار البيضاء ad-Dār al-Bayḍāʼ, the Arabic translation of the Spanish Casa Blanca, meaning “white house”. The city came under French occupation at the beginning of the 20th century, as Morocco became a French protectorate. 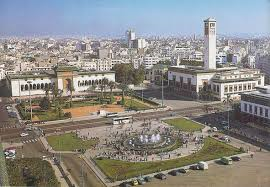 Since Morocco gained independence from France in 1956, the city has become the economic and business center of the country. Located in the Chawiya plain, its very fertile lands have made it the breadbasket of Morocco. One of its most important exports is phosphate. Among other industries, there is also a big fishing and fish canning industry: who has not heard of the delicious Moroccan Sardines? Apart from being the biggest city in the Maghreb, and being so modern with a twist of Hispano-Mauresque, and French architectures, Casablanca is also home to the Hassan II Mosque, with the world’s tallest Minaret. Locals affectionately call it ‘Casa‘, and it is a beautiful city to visit, with a very modern architecture. Enjoy the video below. some trivia that I picked up years ago. Very interesting since my maiden last name is Casablanca. Like the rest of North Africa, the Turks currently control and rule Morocco. The predominant culture in Morocco is essentially Turkish, not the country’s original Berber (African) culture. Morocco is mostly a nation of mulattoes (indigenous African ethnic groups, Albanian and Ottoman Turks). Yes, the original Jews of Morocco were also black people. Many of them came across the Sahara desert from Old Jerusalem, Khaibar, Hebron, Yemen, Egypt, etc. Later, some came in from Spain after Phillip II of Spain (an indigenous black European Catholic monarch) expelled them. Thank you Waxx for this history lesson. You have clarified quite a few things for me. Thanks for commenting.